Size XL and been worn a few times. Still in good condition and the right time to wear for summer. Postage is $5 extra depending where mailing is. We can discuss wether mailing or delivery suits you. 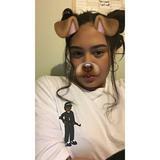 janeyjaneeeeGreat seller to deal with!